PayPal is so easy and straightforward, it’s hard not to love it. This electronic wallet is so popular around the globe that people everywhere know what it’s about, whether they use it or not. PayPal is super secure, crazy quick and downright reliable. The PayPal casino payment option is the go-to choice for players, which is no great surprise. It’s super easy to use, trustworthy and only takes a couple of clicks. Want speedy deposits and withdrawals using PayPal? We thought as much! Whether you want to play our brill games or grab your jackpot winnings, PayPal makes casino transfers as smooth as OJO! Before the OJO party kicks off, you’ll need to open a PayPal account and make sure you have sufficient funds there. You’ll need to do this before you can enjoy online slots or any other casino game for that matter, using a PayPal deposit. 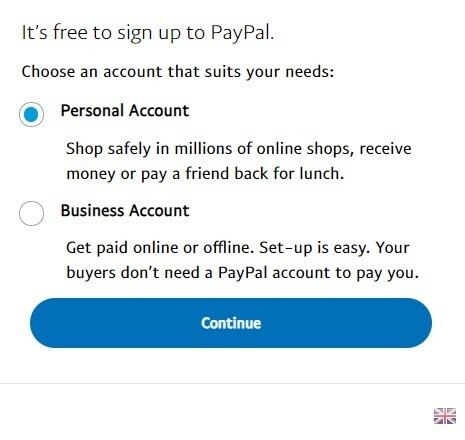 Pop over to PayPal.com and click “sign up” to begin the process of setting up a free personal account. There are simple instructions to follow once you’re there. To add money to your account, you can link your personal PayPal account directly to your credit or debit card. Plus, as a PayPal member, you can even have a pre-defined amount of credit linked to it. Setting up an account is a painless process that you can achieve in 3 simple steps. Check out this useful video from PayPal that shows you just how fast and easy it is to setup a personal account in the UK. Step 1 – Login to your PlayOJO account or register an account by following the simple sign up process. 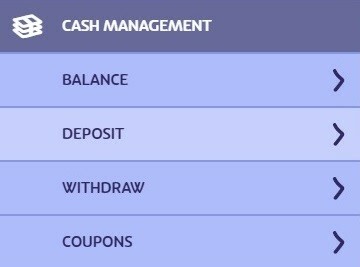 Step 2 – Click on “Deposit Now” or go to “My Account” to access the “Cash Management” section and select “Deposit”. Step 3 – Select “PayPal” from the list of available casino banking methods. Step 4 – Enter the amount you want to deposit. You’ll also have an option to enter a “Kicker Code” for those times when you’ve got a little treat pending. Then just click “Submit”. Note from OJO: The minimum amount that you can deposit with PayPal is £10. 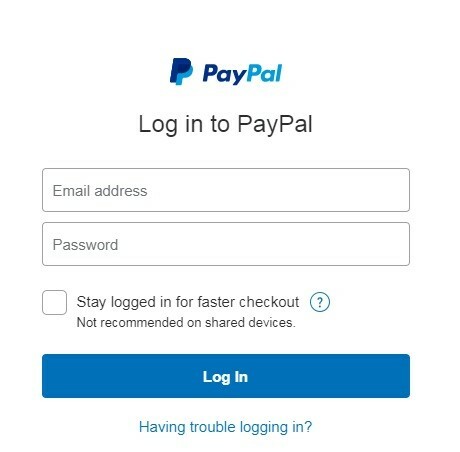 Step 5 – On the next screen you’ll either be taken straight to the PayPal login screen or you’ll see the message below. Just click the “Open Payment Method Page” button to be taken to the next step. Step 6 – Now login to your PayPal account to verify your requested transaction. Voilà! That’s all there is to it! Your PayPal funds should appear in your account within seconds to minutes! You’ll be on your way to playing your favourite games quicker than a spin of the OJO wheel – and that’s fast stuff. Step 1 – Login to your account. 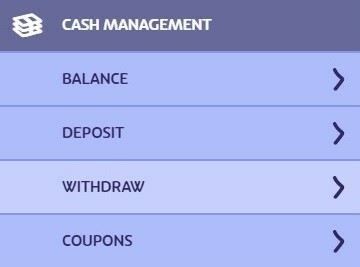 Step 2 – Select “Withdraw” from the “Cash Management” section in your account. 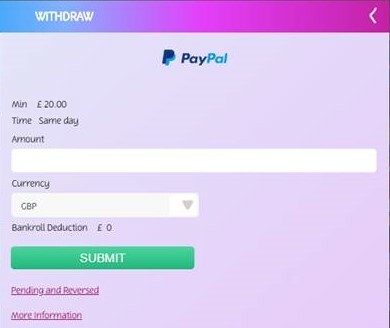 Step 3 – Select PayPal from the available withdrawal options. Note from OJO: You’ll only be able to use PayPal as a withdrawal option if you’ve made a deposit with PayPal. If you don’t make a casino deposit with PayPal, you won’t be able to withdraw to PayPal, even if you have a PayPal account. Soz. Note from OJO: The minimum amount that you can withdraw with PayPal is £20.00, while the maximum is £5,000 per transaction. Step 5 – If your withdrawal is successful, the payment process will begin. However, if this is your first time making a withdrawal request, OJO will ask you to upload a few personal docs to verify your identity. This is for security purposes and is in place to keep you safe. Want to know more about the documents needed to validate your withdrawal? Have a peek here. Step 6 – Once your identity has been verified, the payment process will begin. 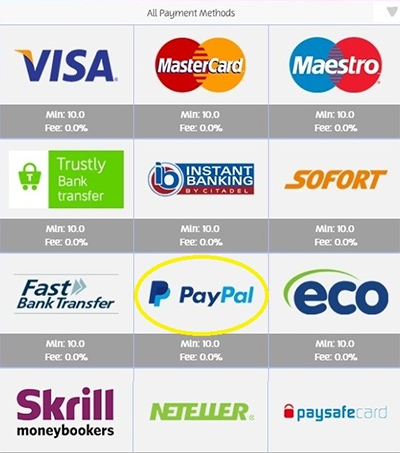 PayPal is one of our fastest payment methods, with processing times being between 0 – 24 hours. Whilst it can take a few business days for the funds to show on your PayPal statement, your OJO account balance will be updated instantly. Note from OJO: If PayPal isn’t a withdrawal option for your particular country, that’s ok! We have plenty of other safe and reliable payment methods to get your winnings into your account so that you can get on with playing. Wondering if you can enjoy bonuses and promotions if you choose PayPal as your payment method? Well of course you can! All of OJO’s wager-free goodies are yours to claim with PayPal or any other payment method. This includes Kickers, OJO’s Welcome Offer and OJO’s Specials like Club OJO, The OJO Wheel, and OJOPlus. Easy peasy lemon squeezy. Ready to open up OJO’s Welcome Offer with PayPal? You can claim it now! Note from OJO: If the “Kicker Code” box is already filled in with “MyKicker” when you make a deposit, you’ll get your last claimed Kicker with your deposit. 1. How does PayPal work? This digital payment method has been around since 1998. 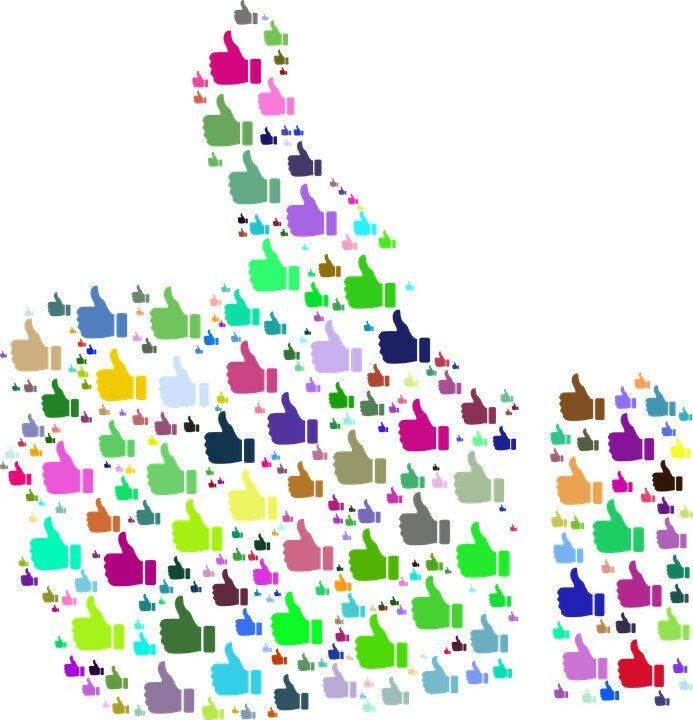 It is now used by over 200 million active users worldwide and available in over 200 markets across the globe. It’s a safe, simple and no-nonsense way to send and receive money online. It also happens to be available in all major currencies. You can use PayPal to shop online, send money quickly to anyone with an email address and send money to your online casino account (top UK casinos like PlayOJO). 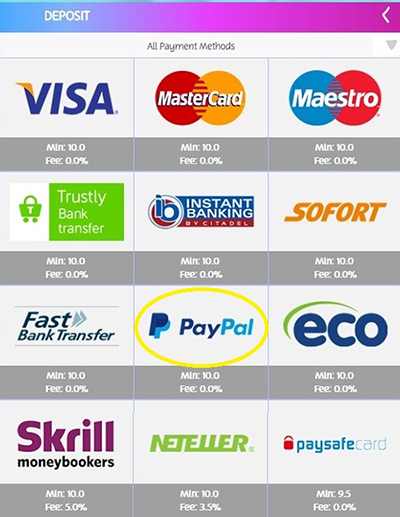 You can even use PayPal on the high street as more and more shops are now accepting this payment method. Once you’ve created a free PayPal account using your email address, your card or bank account will be linked to your PayPal account. From then on, you won’t need to provide your card details every time you use it because it remembers your details. How nifty is that? These details are stored with the highest level of security encryption and PayPal will never share these details with anyone. 2. What are PayPal Advantages? Fast deposits – Your email address and password are all you’ll need to make a deposit. Fast funds transfer – The money is usually deposited directly into your casino account immediately after the transaction is confirmed. High security – PayPal employs strict security measures to ensure the safety of your money and personal financial details. They partner with only the most reputable online casinos, like yours truly. OJO does not charge transaction fees for deposits or withdrawals via PayPal. You can enjoy any casino promotion at PlayOJO using PayPal. Mobile casino PayPal deposits and withdrawals are available, including transactions made via PayPal’s mobile app. 4. Does PayPal’s buyer protection extend to casinos? While purchases of most goods and services are eligible for this protection, PayPal clearly states that: “Gambling, gaming, and/or any activity involving a chance to win a prize”, does not qualify for buyer protection. Note from OJO: when you deposit at PlayOJO, your money is always safeguarded. Player accounts are kept separate from the casino’s accounts. All of your assets in your player account are protected. 5. What are the fees when using PayPal? OJO doesn’t charge you any fees to use PayPal when making deposits or withdrawals. This doesn’t mean that PayPal won’t charge you fees to use its own services. Typically, PayPal is free to use to send or receive money in the UK provided that the payment is originally funded by a bank account, debit card or PayPal balance and no currency conversion occurs. Fees can come into play when either: there are currency exchanges, you’re using a credit card or you’re sending money abroad. Be sure to read PayPal’s user agreement to learn more about fees and other T&Cs related to your account. 6. Why do only some online casinos accept PayPal? Why can’t all online casinos be as cool as OJO and offer you PayPal as a payment method? The simple reason is that PayPal must approve each online casino that uses its service. To be approved by PayPal, an online casino must demonstrate that they have the ability to block gambling activities for account holders in jurisdictions where gambling activities are illegal. 7. Is it legal to play in a licensed casino with PayPal? Of course! PlayOJO is fully licensed and regulated by the UK Gambling Commission. Anything we offer to you, from games, promotions and payment methods – including PayPal – is 100% legal. That’s an OJO promise! 8. Why do OJOers like to use PayPal? PayPal cuts out the middleman. When playing with PayPal, you never need to provide PlayOJO with your bank details. PayPal uses the best security systems to ensure the safety of your transactions, always. Online casino PayPal deposits occur instantly and withdrawals are speedy. PayPal keeps a complete record of your purchases and notifies you every time one is made, allowing you to stay in control of your funds all the time. 9. What type of OJO casino bonuses can you get with PayPal? Short answer: all of them! 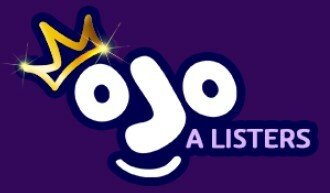 Note from OJO: Remember, OJO isn’t your average online casino. You’re not going to find conventional match deposit bonuses here. OJO’s all about fair play. There are no wagering requirements on any of our offers. The money you deposit and any money you win is yours, always. No strings! 10. Can PayPal be used for Club OJO? Yes! If you’re in OJO’s A-Lister Club, you can totally take the PayPal route. PayPal is for all OJOers. Play your way through the levels of Club OJO to get bigger and better rewards. The benefits include a personal account manager, exclusive offers and higher deposit and withdrawal limits, and that’s just for starters! You never know when OJO PayPal high rollers will be invited to become A-Listers. It’s quite the life I tell you. 11. What type of PlayOJO casino games can I play while using PayPal? Long answer: if you can find it, you can play it! 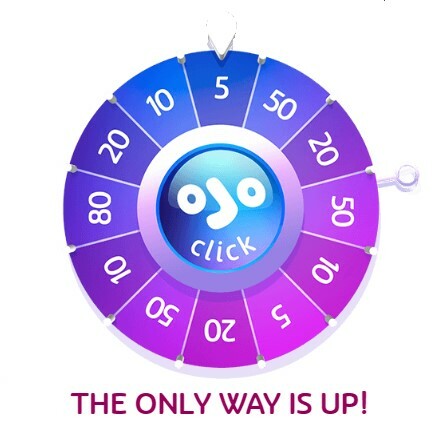 For starters, OJO’s got the hottest PayPal slots, including classic 3-reels, fruit machines, video slots with multiple ways to win, branded slots, 3D slots and more. You’ll also find PayPal slots UK players love, such as progressive jackpot games that could see you winning millions if you’re lucky! 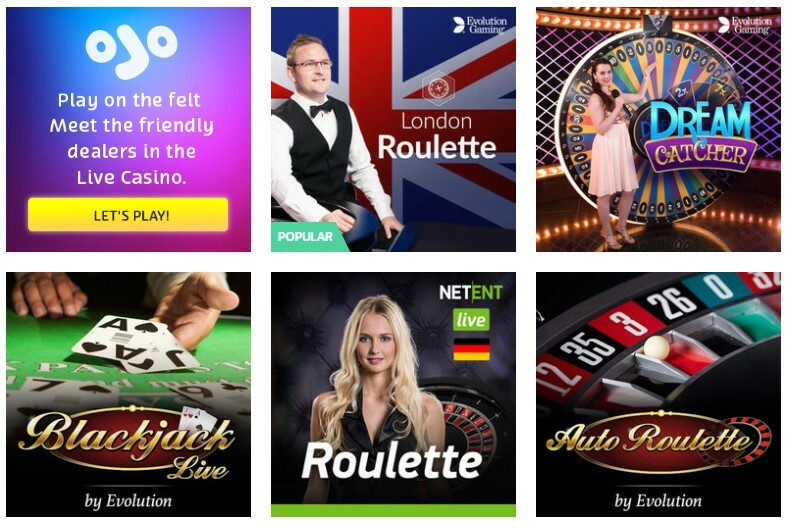 Beyond PayPal slots online, you can also enjoy Roulette, Blackjack, Baccarat, and other card games, not to mention our premium Live Casino games. It’s simply a matter of making your PayPal deposit and you’ll be ready to roll! 12. Can I play OJO’s Live Casino with PayPal? Of course, amigo! Live Casino PayPal deposits are also accepted, so you can enjoy state-of-the-art, interactive Live Casino entertainment anytime, anywhere, even on your mobile. 13. 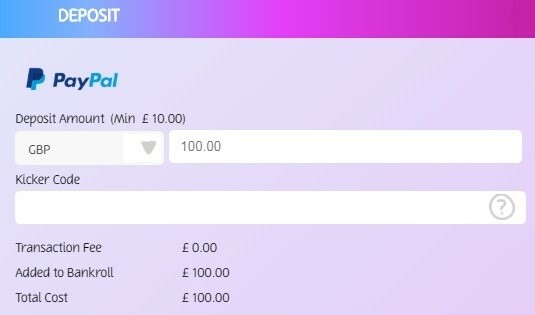 Can I use PayPal in OJO’s mobile casino? Yep! It doesn’t matter which platform you choose, OJO provides this eWallet option for both online and mobile play. You can easily make PayPal deposits via OJO’s mobile web or you can download the PlayOJO app for iOS or Android and make your deposits from the app. 14. What are the best PayPal casino banking alternatives in 2019? 15. What if I need PayPal assistance? Need a little help with your PayPal deposit or withdrawal? Give OJO’s crew a call! They’ll help you with any issues involving payment methods or your casino account. If you got a few questions about your PayPal account, then you’ll probably be best off getting in touch with one of the guys at PayPal. You can find all the info on the PayPal’s official website. Always provide correct personal information when creating your PayPal account and your casino account. Even the simplest mistake can prevent a payout or cause a transaction delay. Only use a PayPal account and casino account that is in your name. Don’t expect the money you withdraw to show up in your PayPal account immediately. Even though it will be gone from your casino account, it can still take 1 to 2 days to appear in your PayPal account. This is normal and your money will always remain secure in transit. Is PayPal the right online casino banking choice for me? Are you willing to set up a separate account with a payment company to make deposits and withdrawals? Do you want to make instant deposits? Is it important to you that your withdrawals process in 24 hours or less? Do you like the idea of no casino transaction fees? Do you want to make secure transactions with peace of mind? If you answered “Yes” to any of these above questions, PayPal could be the ideal payments option for you! Ready to deposit with PayPal now? Let’s play!